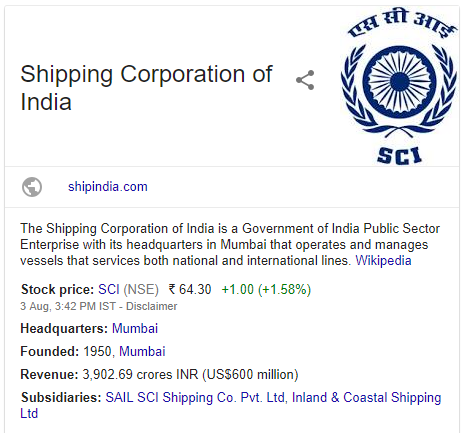 SCI Recruitment 2018: Shipping Corporation of India 50 Vacancy of Electrical Officer – 1950 founded Government of India Public Sector Enterprise – Shipping Corporation of India (SCI) is looking for 50 Electrical Officers and Trainee Electrical Officers. Although, 5 years of age relaxation for the scheduled tribe and scheduled caste candidates and 3 years of age relaxation of other backward class candidates will be given. Yet, if you’re below 30 years of age, easily for this job vacancy before the last date. 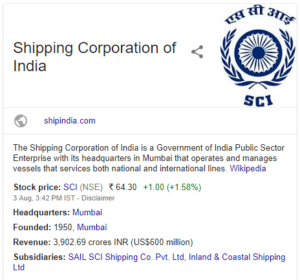 Interestingly, Medical Examination will be conducted by DG approved doctors of Shipping Corporation of India but Medical Exam Fees will have to be paid by the appearing candidates. And, as a result of relaxation, Age Limit becomes 45 years for Retired Indian Navy Personnel with Bachelor of Engineering/ Diploma awarded by the Indian Navy, and has sailed as chief artificer (power side only), and is in possession of DG approved ERO course and ETO COC. Maritime Training Institute (MTI) Course fee is Rs. 4,10,000/- which is non-refundable at any point in time. ETO pre-sea course is mandatory to go through for all the selected candidates who will be chosen after the declaration of SCI Recruitment 2018 Result Online. Daily Wages for this recruitment will be Rs. 2600/- to Rs. 3300/- will be therefore all the electrical officers shortlisted on the direct contractual basis. Besides, the consolidated pay of Rs. 10,000 per month to be given for candidates who will be declared passed after SCI Recruitment Result of Trainee Electrical Officers for eight months onboard training. Only those candidates who will give more than satisfactory performance will be given per month salary of Rs. 30,000/- per month. Besides, it is just 30 years for candidates with Bachelor of Engineering/ Bachelor of Technology/ Diploma in Electrical or Electrical and Electronics, and in possession of DG approved ETO course certificate and ETO COC. In this case, as well as, candidates to have 4 basic STCW courses and STSDSD/ SSO Certificate from DGS approved institutes. For more details related to this recruitment, candidates can either download this official notification or visit ALLINDIAROUNDUP website.